The software is a complete set of tools for designing lawns, buildings, decks, patios, edging, retaining walls and other landscaping features. LASN: Is Realtime Landscape Architect easy to learn? What technical support does Idea Spectrum offer? IS: Realtime Landscape Architect includes online tutorials, comprehensive built-in help and a quick-start guide. 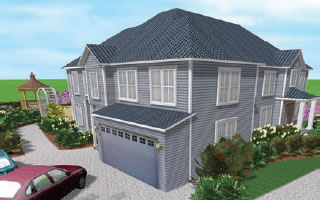 The software is easy to use and no prior CAD experience is required. The wizards (11 in all) provide step-by-step directions for designing your landscape, adding plant labels, importing new materials and other common tasks. Free email and toll-free technical support is provided to all customers regarding all of our products. Realtime Landscaping Architect is a set of integrated software applications for designing landscape plans, 3D walkthroughs/presentations and photo-based landscape designs. Eleven "wizards" provide step-by-step directions for designing your landscape. LASN's associate editor of technology. 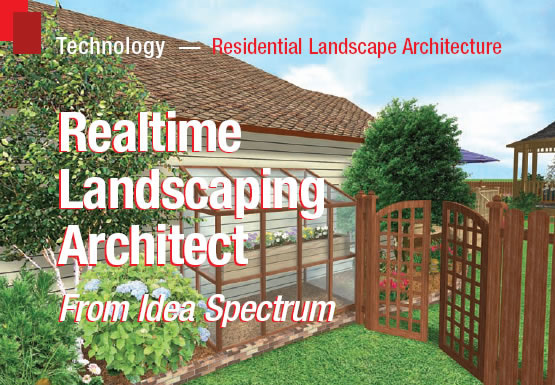 his month's article covers a review of Realtime Landscaping Architect software produced by Idea Spectrum. 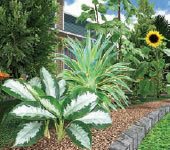 Realtime Landscaping Architect is a set of integrated software applications for designing landscape plans, 3D walkthroughs/presentations and photo-based landscape designs. The software runs on Windows XP/Vista[/7] and costs [$379.95]. LASN: How do you create landscape plans using Architect? IS: Architect includes a complete set of tools for designing lawns, buildings, decks, patios, edging, retaining walls and other landscaping features. The focus of Architect is on residential landscaping, but many of our customers use it for commercial design as well. The software includes over [16,000] objects and materials, including [6,650] high-resolution plants and [3,000] accessories. You can also import additional objects. Google's 3D Warehouse has [millions] of objects you can download for free. LASN: Please give us a brief history of Idea Spectrum. IS: Idea Spectrum was founded in 2004. Our top goal is to make it easier for both homeowners and professional landscapers to design their landscapes. We work closely with the landscaping community to ensure every feature is easy to use and meets their needs. Realtime Landscaping Architect was released in March 2008 and is the result of over four years of development. It is the first program to combine landscape plans, 3D presentations, real-time walkthroughs and photo-imaging in one integrated product. LASN: How is this software different from traditional CAD? IS: Unlike traditional CAD software, where objects consist of simple shapes such as lines and polygons, objects in Architect work at a much higher level. For example, decks are designed by drawing their outline, then everything else-joists, posts, deck surfacing, railings-is created automatically. When you add stairs to the deck, the deck and railing are automatically rebuilt to accommodate the stairs. This significantly increases productivity and reduces the time required to make revisions. In fact, many designers bring their laptop and make changes right at the jobsite. LASN: How do you create 3D landscape designs? IS: It's very easy. The 3D view is created automatically. For example, when you add plant symbols in the plan view, the corresponding 3D objects appear in the 3D view. The views are linked, so changes in one view are automatically applied to the other. You can design in either view and freely switch back and forth as needed.